William Clark’s older brother George Rogers Clark is perhaps one of the most underrated figures in American history. 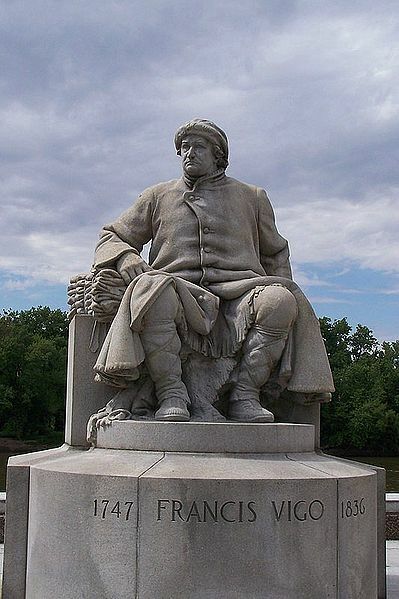 Snubbed by his country during his lifetime, George Rogers Clark is left out of many historical accounts of the American Revolution today—an almost unpardonable omission, considering that Clark was personally responsible for securing the Illinois Country for the United States. Acre for acre, it could be argued that the Illinois Country—now the states of Ohio, Indiana, Illinois, and part of Michigan—was at least as important to American expansion as the Louisiana Purchase. Last week, we stopped by Old Fort Harrod, where young George Rogers Clark rallied the settlers and planned the defense of the American settlements west of the Allegheny mountains against British-backed Indian attacks. In 1776, twenty-four year old Clark was elected by the settlers of Kentucky to petition Governor Patrick Henry of Virginia for aid, support, and official recognition. A rugged, likable, and charismatic redhead, Clark convinced the Virginia General Assembly to make Kentucky a county of Virginia and returned with 500 pounds of gunpowder for the defense of Kentucky. Lt. Governor Henry Hamilton - the hated "hair buyer"
During the “year of the Bloody ’77s” that followed, Clark came up with a bold plan to gain control of the Illinois Country. The “hair buyer” Lt. Gov. Henry Hamilton in Detroit was paying the Indians for American prisoners and scalps and supplying them from posts in Illinois, and the situation for Kentucky settlers was becoming increasingly desperate. Again Clark traveled to Virginia, and again he persuaded the General Assembly to take action for the defense of Kentucky. Clark was commissioned a Lieutenant Colonel and was given permission to raise a force of seven companies with 50 men each. Secretly, Patrick Henry also gave him written orders to attack French settlements and posts in the Illinois Country and bring them under American control, the better to launch attacks against the British and the Indians. Clark may have had a silver tongue with the Assembly, but persuading eastern men to go to war in the western wilderness was a tough sell. By the time he finally set out from the East, Clark had enlisted only 150 frontiersmen and some 20 settlers and their families. Reaching the Falls of Ohio, Clark established a supply base on Corn Island and boosted his small force with a handful of reinforcements from the Holston River settlements. When Clark revealed his plan to attack Kaskaskia, the task seemed so hopeless that it took all his persuasive powers to prevent his men from deserting. On June 26, 1778, Clark left for Kaskaskia with 175 men. In a scene straight out of a movie, just as Clark’s small force “shot the falls” in their canoes, the sun went into a total eclipse. Realizing that superstition could sink his hopes, Clark somehow convinced the men this was a good omen rather than a bad one for their upcoming campaign. With oars double-manned, they avoided detection and reached the mouth of the Tennessee River, where they hid the boats and marched overland for six days. Clark had his men dress in Indian fashion and marched them single-file, in order to leave less evidence of their presence. Clark’s force surprised Kaskaskia on the night of July 4, occupying the fort and the town without a shot being fired. 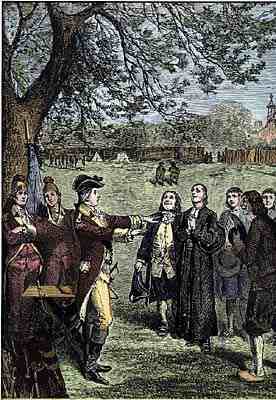 Clark offered the French inhabitants “all of the privileges of American citizenship” in return for their oath of allegiance of safe conduct out of the area. This offer, and the news of the recent French-American alliance, proved critical to his success. Kaskaskia’s priest, Father Gibault, went to Vincennes (now in Indiana) and persuaded the French inhabitants there to ally themselves with Clark. Clark sent Captain Leonard Helm to Vincennes take command of Fort Sackville. You can now judge who is in the right. I have already told you who I am. Here is a bloody belt and a white one, take which you please. Behave like men, and don’t let your being surrounded by the big knives cause you to take up the one belt with your hands, while your hearts take up the other. If you take the bloody path, you shall leave the town in safety and may go and join your friends, the English. We will then try, like warriors, who can put the most stumbling-blocks in each other’s way, and keep our clothes long stained with blood. If, on the other hand, you should take the path of peace, and be received as brothers to the big knives, with their friends, the French, should you then listen to bad birds that may be flying through the land, you will no longer deserve to be counted as men, but as creatures with two tongues, that ought to be destroyed without listening to anything you might say. In reality, Clark’s bluster was mostly bluff—he knew his small force had no hope of overcoming the unaffiliated Indians and the British combined. But such was his credibility and personal charisma that many of the tribes elected to maintain their neutrality. Meanwhile, Henry Hamilton was incensed to learn that Clark had occupied Kaskaskia. Gathering his forces, he rushed to Vincennes and forced Captain Helm to surrender it back to the British on December 17, 1778. With his troops shivering in the brutal Midwestern winter, Hamilton elected to postpone taking Kaskaskia until spring and instead spend the winter reinforcing Fort Sackville. That was his first great mistake. His second mistake was to allow a Spanish trader named Francis Vigo to leave Vincennes. Sympathetic to the American cause, Vigo promptly sought out George Rogers Clark and reported the fall of Fort Sackville and Hamilton’s plans. On February 6, 1779, with 172 men, nearly half of which were French volunteers, Clark marched from Kaskaskia. The 240 miles between Kaskaskia and Vincennes could normally be traversed in about five or six days. Now, however, it was a flooded, frozen swamp, with swollen Wabash River standing between Clark and his goal. Amen on GRC not getting the credit he deserves. Most of my research indicates the fact the he didn’t serve in the Continental Army started the chain-of-events that cheated him in the history books. This is all news to me, Frances. Keep up the good work!